Today, U.S. News & World Report and Best Lawyers publicly announce the Eighth Edition of the "Best Law Firms" rankings. 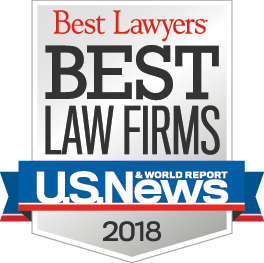 Firms included in the "Best Law Firms" list are recognized for professional excellence with persistently impressive ratings from clients and peers. Achieving a tiered ranking signals a unique combination of quality law practice and breadth of legal expertise. Learn More About "Best Law Firms"